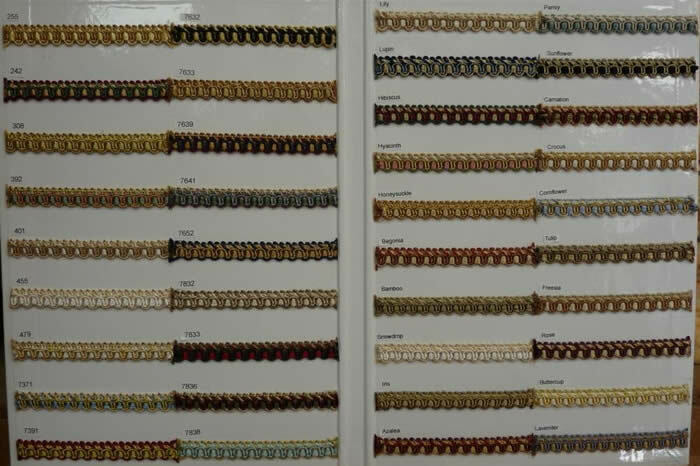 We carry a wide range of trimmings from major manufacturers. All items are available to order in whole packs while some, shown below, are also available in cut lengths. There are far too many to show here on our website: please ask for a colour catalogue or click on the maker's links here. 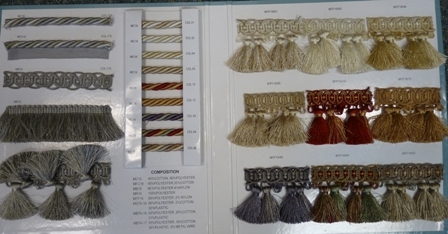 Brand new for 2015 is our Carnival braid, available to order as cut length or cards. all colours – pattern card available. To download a larger image of the pattern card shown right (pdf), please click on the image. A wonderful collection of 200 double piping cords and exotic braids. From Paris. Sample book available. 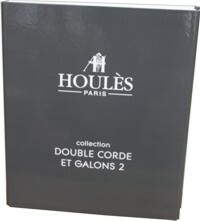 Houlès catalogue. To download a larger image (3 pages pdf), please click on the image.